Upper Devonian, Middle Frasnian, Domanik Formation. Borehole Shuda-Yag-1003: fig. 1-4 - sample 72 (depth 71.9-72.4 m), fig. 5, 6 - sample 68 (depth 73.3-73.5m), fig. 7 - sample 73 (depth 71.4-71.9 m). 1. Conical spines with round basal cross-section (1-6). Fig. 1, 2. Bientactinosphaera conglobata (Nazarov), FF-P001/025-08423, 1 - (bar=20µm), 2 - detail (=7µm). Fig. 3. Bientactinosphaera variacanthina (Foreman), FF-P001/015-08527 (=15µm). Fig. 4. Radiobisphaera assidera (Nazarov), FF-P001/101-08506 (=7µm). Fig. 5. Radiobisphaera menneri Afanasieva, sp. nov., FF-P001/014-04714 (=7µm). Fig. 6. 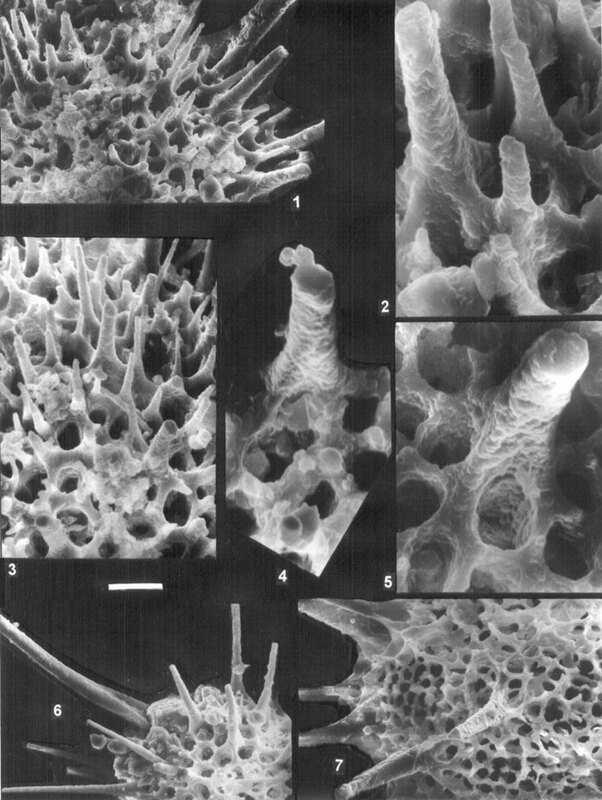 Borisella mariae Afanasieva, sp. nov, FF-P001/051-04708 (=33µm). 2. Three-edged spines with triangular basal cross-section (7). Fig. 7. Moskovistella lucet Afanasieva, sp. nov., FF-P001/054-08806 (=18µm).